Texas Handler On Mad Bevo Attack: "He Was Just Going To Say Hi"
Texas defeated Georgia in the Sugar Bowl 28-21 on Tuesday night, likely thanks in large part to the intimidation provided by their mascot, a 1,600-pound steer named Bevo, against Georgia’s mascot, a 62-pound English bulldog named Uga. 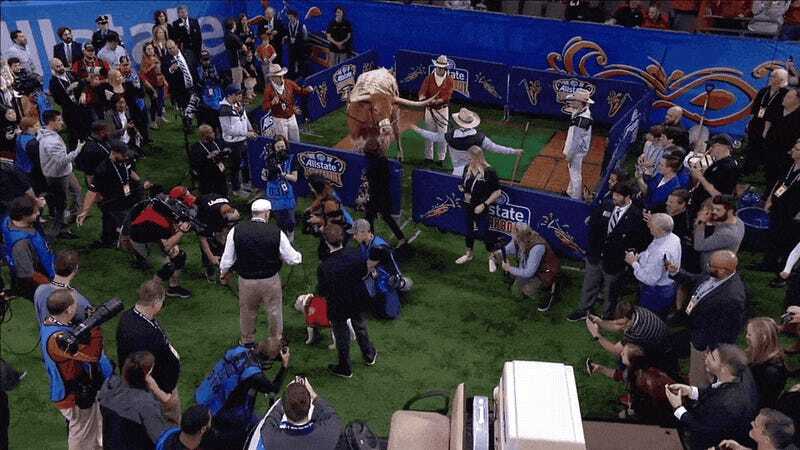 In a breathless pre-game confrontation that was thankfully covered in full by ESPN, a very chill Uga was let out of his cage near Bevo’s pen for a photo op, but found himself suddenly forced to scamper away when the Texas steer unexpectedly overpowered his handlers and knocked down his pen. The scary charge lasted all of about three seconds, and a photo of the two clashing animals was still taken. But it’s obvious which side had the mental edge. “He’s a healthy and happy Bevo,” Baker said. “Moo,” Bevo added, when reached for comment.